Whether coconut oil is a source of healthy fat is somewhat controversial because of its high saturated fat content. The saturated fat in coconut oil, however, consists mainly of medium-chain triglycerides, unlike the long-chain triglycerides found in animal-based sources of saturated fat. This type of fat doesn't seem to raise your cholesterol the way other types of saturated fat do. It may also offer some health benefits, including potentially helping you reduce your belly fat. Coconut oil is pure fat, with 117 calories and 13.6 grams of fat per serving. As with any high-calorie food, if you eat too much of it, you may gain weight. When used as part of a low-calorie diet, however, coconut oil may help you lose belly fat. Men who consumed virgin coconut oil each day for four weeks had a reduction in belly fat of about 1 percent in a study published in "ISRN Pharmacology" in 2011. Coconut oil increases fat oxidation, which causes less fat to be stored in the body, and may also increase the amount of energy your body uses, according to a study published in the "International Journal of Obesity" in 2003. Both of these things can help you limit your total body fat. Study participants who consumed 30 milliliters, or about 2 tablespoons, of coconut oil per day for 12 weeks had greater decreases in cholesterol and waist circumference than those who consumed the same amount of soybean oil, which is much lower in saturated fat, according to a study published in "Lipids" in July 2009. Both participants who consumed coconut oil and those who consumed soybean oil as part of a reduced-calorie diet experienced similar decreases in body mass index, or BMI. Choose virgin coconut oil and not hydrogenated coconut oil, as hydrogenated coconut oil contains trans fats and may increase your cholesterol levels. Limit your total saturated fat intake, including that from coconut oil, to no more than 7 percent of your total calories, recommends the Academy of Nutrition and Dietetics. Instead of merely adding coconut oil to your diet, use it in place of other sources of saturated fat, such as butter or lard. Academy of Nutrition and Dietetics: Coconut Oil – What Is It All About? 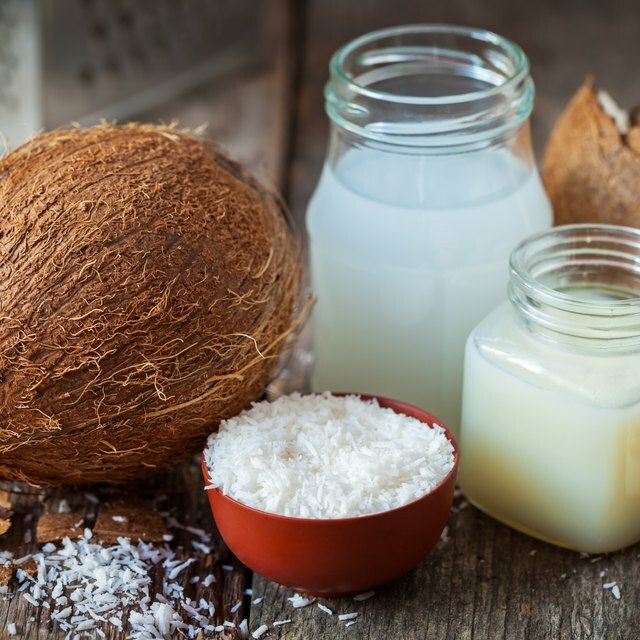 American Council on Exercise: Coconut Oil: Dietary Friend, Foe…or Fad? Can White Gravy Be Made With Almond Milk?